-I need a heat shield on tailpipe as it runs past fuel fill tube. Easy fix. -I need better visibility to side markers and reflectors. Going to just buy 4 more markers with built in reflectors and mount them on each side corner. -Need an approved battery hold down. Hose clamp aint going to cut it. Easy fix, i have one just need to install it. -Fender rubbed on tire at full lock over curb. Easy fix, increase ride height. Done. I have coilover suspension. I'll go get lights here shortly and install them tonight along with battery mount and heat shield. I pretty much begged him not to make me trailer my car back to garage and im waiting to hear what he has to say about that. Met again at shop. QOA Inspector please with updates. Commented that i should be getting something very soon. I assumed he meant title. You must be excited and relieved at the same time. I'm pretty stoked. Im leaving next week so hopefully all my stuffs in the mail when i return from the beach. I'll updated first post with pics and stuff but the moral of the story. Anyone in PA, expect to go to shop a few times, be patient. PennDOT's not out to crush dreams but they do want to protect there arses. Pay very close attention to the details in Pub 45 online, section E and K and the lighting table at the bottom for passenger vehicles. Got home last night from vacation and everything was there. No longer waiting on the state to drive my creation. Now im waiting on Grundy lol. 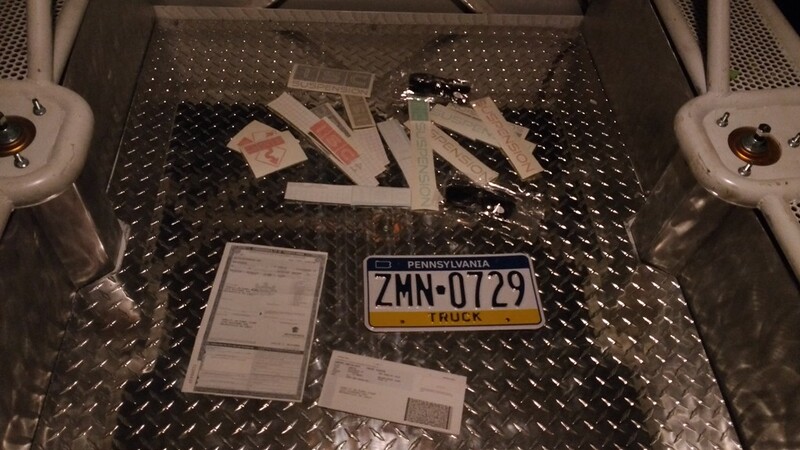 Got the VIN plate, Title, and Registration and Plate came in same envelope. ISC also sent my a congrats package too.